Last week saw the last development in the recent rift within the China International Economic and Trade Arbitration Commission (“CIETAC”) with the unveiling of the former CIETAC Shanghai sub-commission’s new name and logo. This announcement comes after the CIETAC’s headquarters in Beijing (“CIETAC Beijing”) revoked the authorization granted to its Shanghai and South-China (Shenzhen) sub-commissions to accept and administer arbitration cases (Read: SPECIAL ALERT: A Big Battle among China Most Important Arbitration Institution “CIETAC”) last December. At this time, CIETAC Beijing further forbade the former CIETAC Shanghai and Shenzhen sub-commissions from continuing to use the name, brand, or logo of “CIETAC”, either in Chinese or in English, and to conduct any further arbitration activities in the names of CIETAC Shanghai Sub-Commission and CIETAC South China Sub-Commission. The unveiling ceremony that was jointly held on April 11, 2013 by the Council for the Promotion of International Trade Shanghai (“CPIT Shanghai”) and the Shanghai International Economic and Trade Arbitration Commission (“Shanghai International Arbitration Center”, the “Commission” or “SHIAC”) hopefully put an end to the infighting within one of the biggest permanent arbitration institutions in the world while giving a name to the newly independent SHIAC. More than 500 guests attended the ceremony, including arbitrators of the Commission, representatives from the Shanghai High Court and Intermediate Courts, government’s officials, 41 consulates and over 30 chambers of commerce. Shanghai Arbitration Commission, Beijing Arbitration Commission, Shenzhen Court of International Arbitration, and Hong Kong International Arbitration Commission sent their representatives to attend the ceremony. Guests also included representatives from over 60 top Chinese law firms and over 50 foreign law firms. Amit Ben-Yehoshua, the creator of chinalawflash.com and founder of the International Legal Skills Center attended the event on behalf of Da Cheng Law Offices. The Shanghai Municipal Government approved the name change, clarifying the status of the new commission. 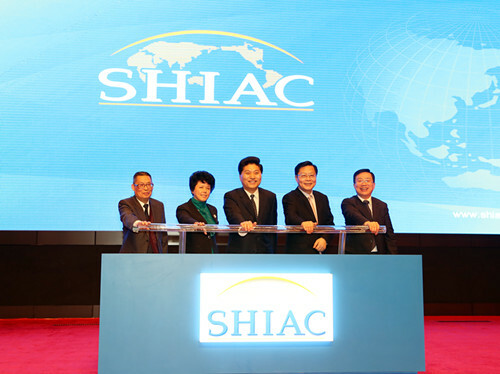 During the ceremony, Mr. Cen Furong, Chairman of CPIT Shanghai and SHIAC, elaborated on the meaning of SHIAC’s new name, making it clear that this ceremony was not just about changing names but marked the starting point of a new era. Located in the commercial and financial center of mainland China, SHIAC aims to become both a regional arbitration center and a major international arbitration institution. While changing its name, the Commission further amended its arbitration rules, expanded its panel of arbitrators and designed a new logo. Because CIETAC Beijing and SHIAC are now two separate entities with different set of arbitration rules, we recommend the parties of a contract where an arbitration clause refers to CIETAC to seek counsel and advice from your China law practitioner to discuss the impact of the current situation and review the terms and conditions of such clause.